European Capital of Culture 2021: Which are the Romanian cities that are competing for this title? A total of 14 Romanian cities are in the race for the European Capital of Culture 2021 title, as experts from the European Commission validated their candidacy files. 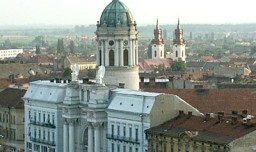 The 14 cities are Arad, Alba, Iulia, Bacău, Baia Mare, Braşov, Brăila, Bucharest, Cluj-Napoca, Craiova, Iaşi, Sfântu Gheorghe, Suceava, Timişoara, and Târgu Mures. A preselection meeting will take place between December 7 and December 10, according to a statement of the Romanian Ministry of Culture. Following this meeting, the European jury will draw up a shortlist of candidate cities. The Romanian Ministry of Culture supports the cities’ candidacies and will assist the winning city in organizing the events, projects and initiatives meant to give a concrete content to the status of European Capital of Culture 2021.